Maa is the language spoken by the Masai. Translation of Masai languages can be complicated because even among the one tribe, there are several different dialects. Maa is classed as a Nilo-Saharan form of language, and a variety of it is shared with the Samburu and the Chamus peoples. By Nilo-Saharan, I mean that this group of languages are spoken through central and eastern African, following the course of the Nile river. Other languages in this group are Luo and Kanuri, each with more than 3 million speakers. The Masai tribe of Kenya and Tanzania numbers over a million people, and is actually one of the best known ethnic groups in Africa. In fact, many place names in Kenya come from a Masai translation, such as the capital city of Nairobi. You might also recognize the name Masai from the popular Masai Mara Wildlife Preserve, which is part of the Tanzanian Serengeti National Park. The word "Serengeti" comes from a Maa word for endless plains. The Masai still live a traditional way of life. That’s why most of them, contrary to the majority of Kenyans, don’t speak English. In some of the villages there are a few Masai who do speak English, but in other cases you’ll have to rely on a guide who does speak the Masai language. You will have a much better experience interacting with the locals if you are with someone who can translate for you. Anyone planning on taking a vacation or safari to east Africa, with the intentions of seeing the breathtaking scenery south of Nairobi, the grassland wildlife or even seeing the Masai people themselves, should try to find a guide anyway. 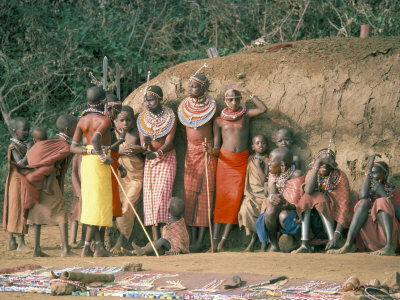 The Masai slowly beginning to give up their nomadic ways, and interact more with people outside the tribe. As a result, their language has become better known, and more of the Masai are learning other languages as well. Some companies are starting to offer Masai translation services as well.